UltraUXThemePatcher modifies your system files so that third party themes can be used. You can download Windows themes from third parties and activate them. The program backups the original system files and all changes can be undone by uninstalling if you have issues. 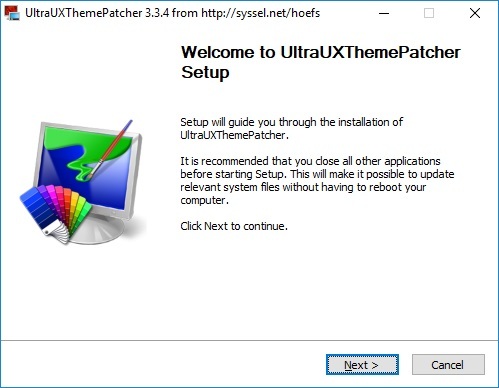 UltraUXThemePatcher is available for Windows XP to Windows 10 (RTM, Anniversary Update 1607, Creators Update 1703, Fall Creators Update 1709, April Update 1803) for 32bit and 64bit version. Windows 10 TH2 1511 (10.0.10586) is not supported! * Note: This application make changes to your system files, this can lead to unexpected problems or total breakdown of Windows! Please uninstall version 3.3.0 before you install a newer version. Only in this case a bug with the Fall Creators Update will be solved completely! After installation It's still not patched. alguien conoce algún parcheador o aplicación de terceros para instalar temas no firmados en Windows 10 v.1511 (10.0.10586.1176).